As a kid I dreamed about hosting fancy adult dinner parties. You know, dressed to the nines, wine, cheese… But now, as an adult, a casual outdoor dinner party under twinkly lights is my little slice of heaven. Gorgeous table spreads can be somewhat deceiving. I think a great table is filled with food (but not too much), drink options and a bit of room to move. When hosting dinner parties I will always do as much ahead of time as possible. Starting with the fun part – shopping for new dinnerware, serve ware, linens etc. And where else would I start (and end) my search but in the Target Home department?! White dinnerware like the open stock options at Target are perfect to mix, match and slowly add to your collection. I LOVE that the Threshold pieces go so well together that I can mix pieces from different lines effortlessly, like these casual modern dinner plates with the appetizer plates. These plates can be mixed with round, colored or other white pieces from Threshold and they coordinate perfectly. I love how all the white popped with these fun spring linens from Target on the wood table. After all my pieces are bought ahead of time, I figure out what food can be made the day before, what can be purchased (baked goods from a favorite bakery) and what can be put in the oven while I’m working on the rest (ham). I usually task the kids with place cards. This year was a group effort with wooden eggs (bottoms sanded a bit to stand and slot cut into the top), gold spray paint, this printable and Spritz glitter alpha stickers. Setting the table can be done first and will help you figure out where everything can fit. I prefer a table be filled with useable items instead of large centerpieces. I do love a bit of color though and I couldn’t resist these bunnies with gold ears! I filled them with fun paper flowers from a Threshold garland instead of real (because I cannot for the life of me keep anything alive). These guys can be used as candy dishes too! After everything is set, I’ll work on the rest of the menu. In this case we made a baked egg/sweet potato dish that just needed to be started 1/2 hour before the guests arrived. So while Jared started the dish I began filling in the table with the rest of the food so that everything would be ready by the time the hot dishes were done. Stacked cake stands make a fun centerpiece with a purpose. This works great if you can find one slightly smaller than another. I love how these Threshold Beaded and Flower cake stands are different, but look great stacked together! With mostly white dinnerware, it’s easy to add pieces of color already in your collection, or a good excuse to add some new ones like these little dip bowls. I love infused water but some of the men in my family don’t like cucumber so I decided to set out cucumber, lemon and mint in bowls so that each person can choose what they want to put in their water. (Tip: if you don’t have time to infuse the water, cut the pieces a bit larger than you normally would so you get the flavors when drinking). Fruit is something you can cut ahead of time or buy pre-cut to save even more. A basket of bread is also great to have out and ready so that as guests arrive and sit down there is plenty to start on before the main dish! Once you have finished putting anything out ahead of time it should be about the time your guests are arriving. Pre-filling glasses and leaving out pitchers of water will make your job as hostess easier too! My husband, Jared, is usually making the final meal so as everyone started to sit down we brought out the ham and he served everyone their main dish. There’s still time for you to host a fun Easter with friends, a big dinner with family or even make the day special for just you and your kids. Easter entertaining can be as big or as small as you want. It’s really all in the details and each season can bring new colors, flavors and details to your table. I got everything you see here at Target – from the glasses to the ramekins. I’m already there weekly anyway, who needs to make another stop?! 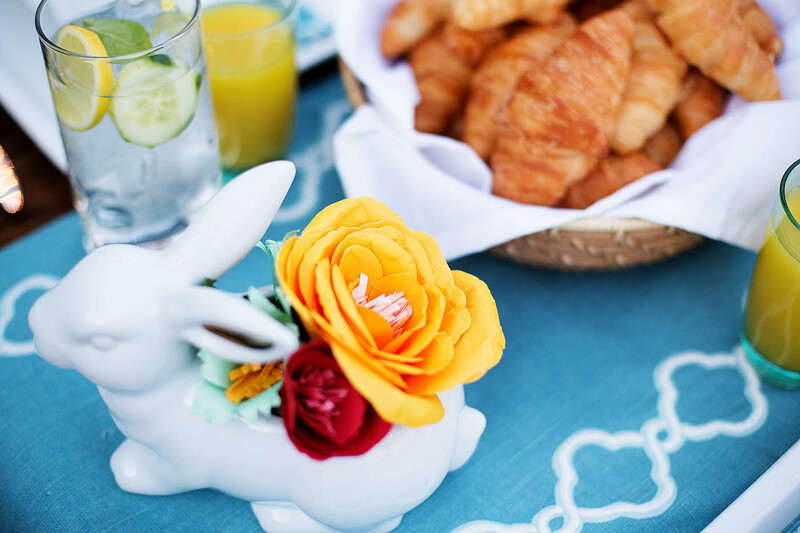 What’s your favorite part about an Easter brunch/dinner?